CCTV, Alarmed & Secure NEW! You will enjoy complete peace of mind with a secure and confidential document storage service that's second to none. 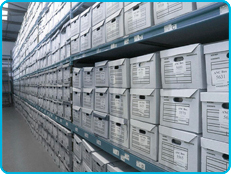 Cambridge storage provides either short or long term solutions that cater to your precise archiving needs. Cambridge storage facilities are in close proximity to the Cambridge Science Parks and all the major routes to the city. The catchment area for free delivery and collection includes Cambridge, Newmarket, Huntingdon, St.Ives, Ely, Royston and Saffron Walden. Whether you require storage for a single box or business archiving on the scale of multiple pallets, Cambridge Storage provides secure commercial archive storage at very competitive prices. Pallets provide up to 20 document storage boxes each. ...organisations and companies just like you. Security is a lot more than just "not getting stolen" - it's the expertise in preserving documents in pristine condition. Cambridge Storage know our business is not glamourous - you will be happy when you can simply forget about your documents - with confidence! You can get all the packaging materials you need RIGHT HERE to provide protection for your goods. We know protection of document's in storage requires using quality archive boxes, tape, bubble wrap, stretch film, strapping tools and much more - all sold here for your convenience. Phone 01223 225555 right now or contact us out of hours on this form to discuss what we can do for you. 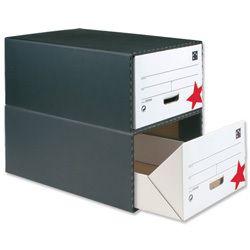 Perfect for business archiving - this easy access storage constitutes permanent stackable filing drawers in packs of 5. It will take the contents of a full filing cabinet drawer (maximum document size 381x254mm). Stacks up to three units high. Contact us to get these drawers now!! !